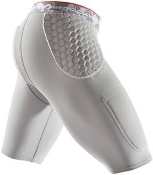 Football girdles protect your legs and vital areas of your body from the rigors of gridiron battle. Utilizing compression fit to keep your muscles warm and in tact is just another factor that make football girdles necessary for every football player. 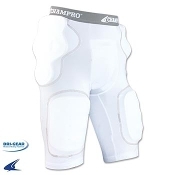 Football girdles are designed with strategically placed padding in the thighs, hips, and tailbone in order to protect the most prevalent areas effected by football contact. Compression fit girdles help to reduce the build up of lactic acid in the muscles creating a sore and tired feeling. They help to provide optimal blood flow to the lower half of the athletes body to maintain speed, power, agility and quickness on the gridiron. Endzone sports offers the industry standard of girdles from Shock Doctor, McDavid, Champro and Stromgren. We offer integrated football girdles with the pads already built in, or with pockets for the pads to slide in to.